1. What are the causes of dry skin? 3. What are the problems of dry skin? 4. Does oil based foundation work on dry skin? 5. How to apply oil based foundation for dry skin correctly? 6. What are the drawbacks of applying oil based foundation for dry skin? Having a dry skin means that it is hard to choose proper makeup cosmetics, as they may cling to your flaky and dry patches. You are considering using oil based foundation for dry skin, but you still don’t know if they work and how to use those products correctly. 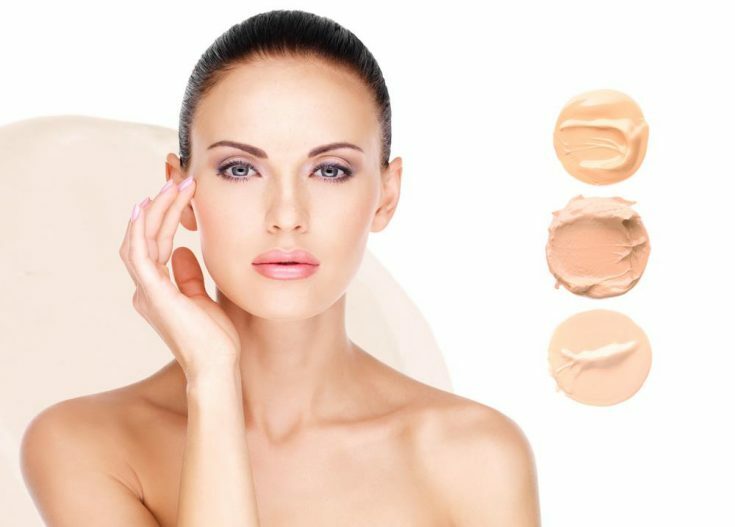 Fortunately, this article will provide everything you need to know about oil based foundation! For people with dry skin, there are many risk factors contribute to this condition, including congenital reasons. Even with some people that own an oily skin, the dryness can still occur anytime if they don’t know how to protect it against harmful agents . Aging problem. It seems that the older you are, the easier you will get dry skin. The explanation for this issue is: the production of natural oil on your skin surface reduces through time, thus increases the risk of dryness. Family history. If your relatives suffer dry skin or any related skin diseases, there is a chance that you will experience the same problem. Weather. In cases the humidity level decreases (such as in autumn or winter, there will be inadequate moisture on the skin and lead to the dry condition. Skincare habits. People who usually wash their faces with hot water too often are more likely to develop dry skin. What are the problems of dry skin? Having a dry skin also means that there are cracking patches and discolorations on your body. On your face, the cheeks, nose and the area between two eyebrows are usually affected. You may have to scale and feel itching, especially after taking a bath or using makeup removers. Choosing the right makeup products that get on well with dry skin is a significant problem. If the foundation is too thick, such as silicone based one, it will be hard to apply on your face and leave behind a greasy outlook. In contrast, the water based foundation sometimes provides insufficient moisture thus enhances the dry and flaky patches. So, is oil based foundation suitable for dry skin? Luckily, the answer is yes! Does oil based foundation work on dry skin? As the oil penetrates into the skin layers more slowly than water, it may sit on the surface and make us feel slick and shiny. But that extra moisture is necessary for people who have a dry skin due to many beneficial effects. According to makeup artists, the oil based foundation should be considered the best option for dry skin . The dominant ingredient of these products should be an oily substance which covers and protects your face against dehydration and brings up a satin finish. Oil based foundation shows their benefits not just for merely dry skin, but for the dry combination and mixed skin types, as it could last for the whole day or even in hot weather. Most oil based products are in cream form rather than liquid and tint substance. Sometimes, you may be afraid of the thick, and oily texture of oil based products compared to water based ones, but it does not mean that it will leave a greasy look on your skin. If you apply the cream correctly with a sufficient amount, it can spread evenly and lightly. In this article, we will gradually guide you how to use this type of foundation combined with other products to acquire the best result. How to apply oil based foundation for dry skin correctly? First and foremost, keeping your skin hydrated plays a vital role in maintaining makeup layers. On a dry surface, powder and foundations tend to cling to the dry patches while fading easily on other areas, which makes your face look patchy. Before any makeup procedure, you need to wash your face thoroughly using a gentle cleanser. The purpose of this step is to remove excess dirt thus prevent clogging pores. Remove any leftover makeup layers on your face if presence. Use cleanser products that designed for dry skin only or they could worsen the dry condition. Besides, if there are dead skin cells on your face that haven’t been removed for a long time, you should get rid of them right away. You still don’t know how to do it right? TOP AMAZING METHODS ON HOW TO GET DEAD SKIN OFF YOUR FACE will help you with this problem. Then, moisturize your skin with unique cream or gel. Remember to focus on the areas on your face that usually be forgotten, such as eyebrows, nose, cheeks and around the mouth. After that, apply primer on the entire face to make sure your skin is smooth enough to receive an even makeup. This step prevents other products from clinging on the dry patches. Do not forget your chapped lips by using some chap-stick to cover them. Here comes the most vital step. 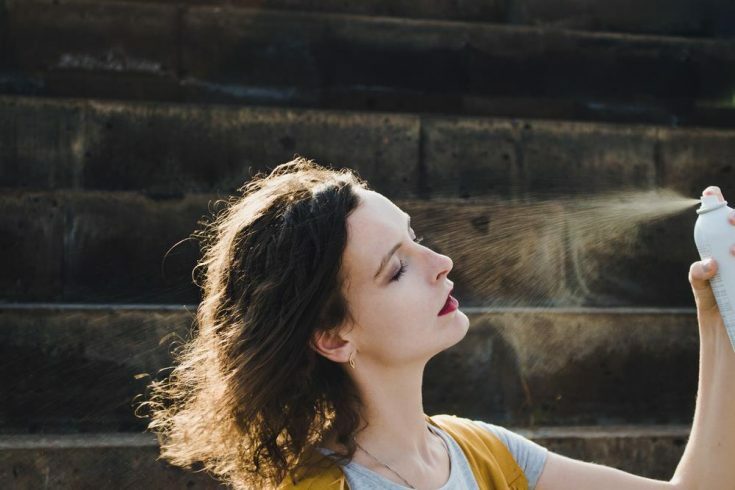 For dry skin people, you need to find the suitable products that meant for you, or they could absorb the remained oil and dehydrate your face. Foundation for dry skin contains the extra amount of moisture – as we have discussed – that make the skin feeling enriched and healthy. You should pick a cream or liquid foundation instead of a powder one, because powder substance may absorb the oil based on your face and make the based makeup look patchy. 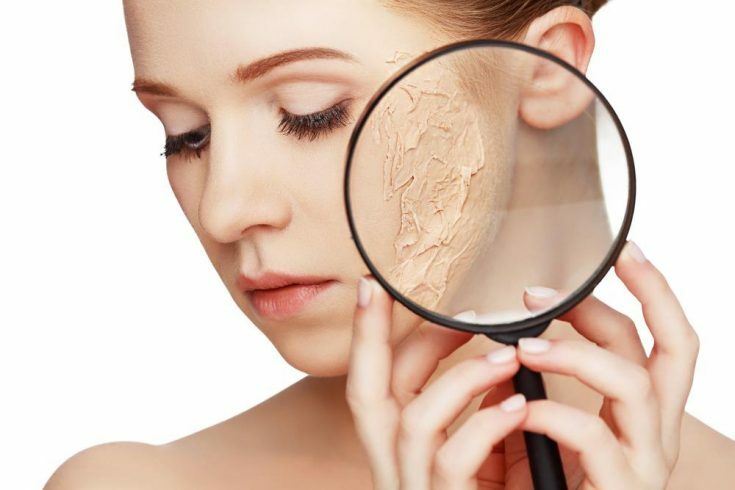 If you still cannot find the most suitable product for your face, we recommend you to spend a few minutes reading WHAT IS THE BEST FOUNDATION FOR DRY SKIN? Take an adequate amount of cream or liquid on your hand, then tap onto your cheeks, forehead, chin, and nose. Use a soft brush instead of fingers to blend the foundation evenly. Repeat until it reaches the desired texture and color, except for the eyelids. Now it is time for concealer. 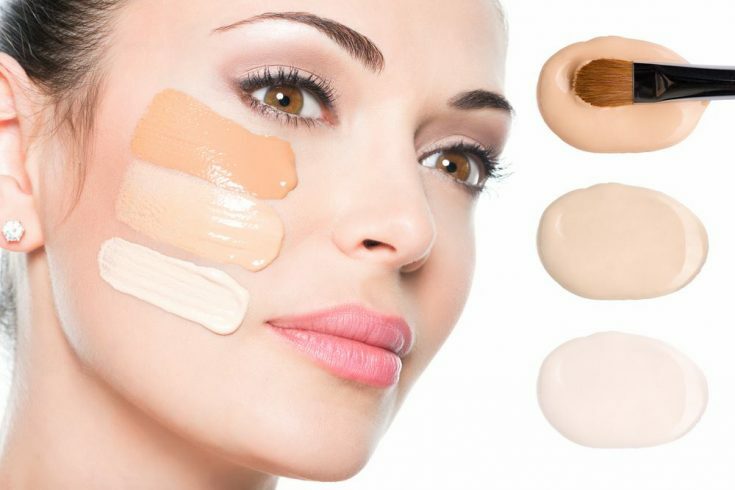 A liquid or cream based concealer is better than a stick one. You can apply it on any imperfect area and use a small brush for the best coverage. Now your face is ready for the remaining makeup process! Start with your eyebrows and eyelids. As the primer went on with your skin, it is much easier to apply eye shadow and liner. With dry skin, a cream based eyeshadow and liquid eyeliner are better than other types, though they may be hard to use. Then use a liquid blush for your cheeks. This product ends up with a smooth finish and lasts for longer than powder blush. Make sure to use a brush to spread the liquid evenly on your cheekbones. The last step is taking care of your lips. After the chapstick was absorbed for a while, your lips become softer and smoother to receive the lipstick. You should pick the products with nourished agents instead of matte and long-lasting ones to prevent dryness. In case your lips become dry again, or you decide to use the matte effect lipstick, a small amount of Vaseline is essential to provide the sufficient moisture. Now you are ready to go out with a gorgeous outlook! But will the makeup layers stay with you all the day? Even with the perfect oil based foundation for dry skin, your makeup still can become faded quickly, especially under harsh environment. So how to deal with this problem? That is why you need to spray you mineral water at the last step to finish the makeup procedure. Whenever you feel dry again, use it and enjoy your healthy and perfect skin! What are the drawbacks of applying oil based foundation for dry skin? Although having unbelievable benefits, there are still some side effects of oil based foundation available. If you are suffering the problem of acne or blackheads, using mineral oil based products may increase a risk of clogging pores and breakouts, as the oily and creamy texture could form a barrier over your face. One more drawback, this oil based foundation doesn’t nourish your skin but just covers it and prevents moisture loss. So it is forcible to use other skin care products such as moisturizer and primer for dry skin before applying foundation. However, with many benefits above, we still believe that they can outweigh the drawbacks of oil based foundations. If you are too confused about choosing oil based products, you can switch to another type of foundation, such as water based ones. To know which one suits your skin the most, click at WATER BASED FOUNDATION FOR DRY SKIN – TOP 5 BEST REVIEWS. To conclude, using oil based foundation for dry skin is still the ultimate option. This article has provided a whole view of this product and tips to use it correctly. We hope this information is useful not just for people with dry skin, but for everyone who is searching for a proper foundation. Remember to LIKE and SHARE this article to help us reach millions of internet users out there! If you have any questions, don’t hesitate to ask. We are pleased to help you!